What do you receive from a designer? The basic question is how to apply a slide master to an existing presentation. When you receive a “regular slide” from a designer, you need to figure out where the design is. If the design is actually on the slide itself, you need to make some changes — and your designer doesn’t know very much about PowerPoint. That’s because in order for you to easily apply the design to other presentations, the design should be on the slide master. Choose View tab, Slide Master. In the left-hand pane, scroll up to the first, larger thumbnail. If the design is on the Slide Master, you’re in good shape. If not, you need to find some way to transfer the design from the slide itself to the slide master. Often all you need to do is to select all of the objects on the slide, cut to the Clipboard, and paste on the first, larger thumbnail (the “Master”) in Slide Master view. Then save the presentation. You should keep the presentation you received unchanged, so save a copy to use as a basis. Then open both the designed copy and your original presentation — the one that you want to apply the design to. In the original presentation, select all of the slides. You can click the first slide, press and hold the Shift key, and click the last slide. You can do this in the left-hand pane or in Slide Sorter view. Then copy them to the Clipboard. Display the designed copy, click in the left-hand pane, and paste. By default, the slides will take on the destination design. In Normal view, click the Design tab. At the right end of the Themes gallery, click the More button, as you see here. At the bottom of the themes gallery, click Save Current Theme. You’ll be in the default Themes folder. Don’t change the folder! Type a descriptive name for your theme and click Save. If you don’t see your theme, click the same More button at the right end of the Themes gallery and choose your theme from the Custom section, as you see here for a light-blue gradient theme that I created. Do you have any questions about applying a design to a presentation? Leave a comment! I like the helpful information you provide in your articles.I’m quite certain I’ll learn many new stuff right here! Best of luck for the next! I had been struggling for 3 hrs before I had the sense to look on U-tube and then found this site. I am an independent contractor and my client has a theme going in three different ways and wants to create a slide master. I have been using PowerPoint for several years and never seen a slide master done this way. Is it possible to create a slide master using an image in three locations in a presentation? I don’t understand the question. Do you mean that you want 3 different images, so that some slides use image 1, some use image 2 and some use image 3? If so, you can do that by using 3 different slide masters and assigning slides to the slide master with the image you want. Thank you for this information. I have a related question. I’ve been asked to copy slides from one presentation (with one or more slide masters)into my existing presentation (already up to 3 slide masters). I attempted the first slide master I saw and pasted it into my presentation. Admittedly, I’m not sure if that’s the right one. I’m not sure how to determine that. But, when I paste the slides the graphics shift. What’s the best way to add slides from one presentation into your existing presentation and either keep the source formatting, in the case of graphics, or have the pasted slides take on the attributes of the presentation they are being pasted into? Thanks for your help. Many thanks – I used he “better way”. You saved me heaps of time !! I am working within a PowerPoint 2010 document that has been tinkered with by multiple people for several years, without consistency or use of the Slide Master and Layout option for inserting slides. I have edited the Slide Master and its downstream layouts, but when I try to apply them to existing slides (through using the Layout option and picking the right layout), nothing happens to the current formatting of the slide. Instead, I get new text boxes on top of the current content. I really want this to be a clean document that can be used easily in future, so I don’t want to tinker with all of the slides one by one. Can you tell me what might be going wrong? Thanks! I received a design from a client that they want to use for a current PPP. I tried the above steps and can do one slide at a time (copy/paste, copy/paste) but was wondering if there was a quicker way to transfer the slides on the current PPP to the new design? I do have the design under Customized but nothing happens when I click on it while in the current presentation. I have listened to your 13 tips and it was very helpful, thank you. Linda, you should be able to apply a theme on the Design tab. If you can’t, try clicking another theme. Does that work? If not, try opening a new presentation and applying that theme. If that works, copy and paste the slides to the new presentation and try again. Can you open the design you got from the customer? Is it a PPTX, POTX OR THMX file? If it’s a PPTX file, you can open it, duplicate it (for safety), and copy and paste slides into the duplicate. By default, they will take on the destination theme. This all seems great but I am still having difficulty trying to relate it to my situation. Just as an intro, I have a large number of Power Point files, around 500 that contain the lyrics for hymns and songs that I prepare for our church services each week. I tried to standardize the format when I first start on this many years ago. So each file contains a Song Title slide of a standard layout and, that is followed by a number of slides all of the same format and layout that contain the lyrics for the song. Each song file has a picture back ground that remains constant over all the slides for that particular song. Not sure if part or all of my problems are because I am trying to fix up really old power point files (reformat them from 4:3 to 16:10 and more) created years ago in possibly version 2003 by converting them to version 2016. I did try using compatibility mode. I am using MS windows 7. With Power Point, I am now using version 2016. When I go into slide master and look at the left hand side where the slide master stuff appears everything looks like a complete mess with these old files (because I never had any idea of how Slide Master worked and I know very little more now!). I see there is the large master thumb nail at the top and numerous masters below it. In my case, the first one or two below the Master Slide either shows it is for the first slide or it is not used. The second one indicates that it is for the remaining slides (2-x) where x is the total number of slides in the presentation. All the others following on from that invariably say “not used”. So, in essence what I need to know is when using 2016, what is the best and simplest way to go about reformatting the text boxes (I want them to be an actual specific size (in my case 14cm high x 23cm wide and location of the text box on the slides including the position of the text within the text box…margins) using the slide master facility. I sort of followed what you have explained here on your web site but have just not been able to get anything to really work for me. So, am I confused about Slide Masters, Yes! Do I understand the logic as they appear in the left hand side of the slide master screen, No! Do I need help? you betcha! I really want to get on top of it once and for all and hope that what I have given you here will help you understand what I want to achieve. Rod, there’s no automated way to convert text boxes on slides to existing layouts. I spend a lot of time doing this manually for clients. But you can start creating new slides using layouts from the Slide master. Some of that mess is probably because you started in PowerPoint 2003 and the conversion to the 2007 + later system isn’t seamless either. Creating the layouts you need is a start and I have a post on that at http://www.ellenfinkelstein.com/pptblog/create-a-custom-layout/. Once you have them, you can start applying the layout to a few slides at a time (start with one to see how it goes) and then copy and paste the content from the text box to the text placeholder. Once you get a workflow figured out, it doesn’t take too long and you could convert 500 slides in a few hours. Good luck! Powerpoint 2010: Why when I have my own model, I cannot update an old presentation with that new model? or maybe how can I do that? 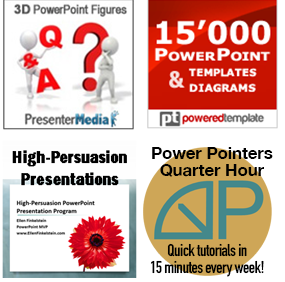 I have tons of powerpoint presentations that we need to update with new logo and format…. What is the best way: use a model or a theme? I’m not sure what you mean by a model. A template? A template can have content in it, like a logo, so if you want to include a logo on every slide with the Title Slide layout, use a template. I’m also not sure exactly what you mean by format. Slide size? Background? You can open a new presentation with a new template and copy all of the slides from the old presentation to the new one. It’s pretty quick. I have powerpoint presentations made in Office 2008. I want to port them over to a new machine using Office 2016. The master slides no longer look right. Is there a way to import themes or masters from the old powerpoint to the new powerpoint? I saved my new template, but when I click “more” on templates it doesn’t show up anywhere on the list. Why not? Very frustrating. Arrrggghhh!!! I have a presentation from NL with there language in the slide masters, fx. : “Alleen beeld, zonder ondertitel” and I have the new theme/templates in language fx. : UK. When I Copy or Reuse or change the theme to the new template (UK), the old slidemaster pages will appear in slidemasters. Is there a way to override or take in the old slides into the new master, without the old slidesmasters? I haven’t used templates from another country, so I’m not sure. The text there, which translates, per Google, to Only Image without Subtitle, may have been put in manually, in which case PowerPoint won’t change it. I would probably try to copy a layout from the old master and paste it within the section that has the layouts for the new master and see what happens.